The award-winning BioLite CampStove's latest upgrade features 50% more power, an integrated battery, and an updated LED dashboard for improved control and feedback. Burning only wood, CampStove 2's fan creates a smokeless fire that can cook meals and boil 1 liter of water in 4.5 minutes, while turning its heat into usable electricity (3 watts peak TEG generated; 5V, 2A USB output). Durable aluminum legs fold up for nested portability. This lightweight CampStove with integrated battery pack is just 2 pounds and includes FlexLight, a USB powered 100 lumen light on a flexible gooseneck for directing light where you want it. This CampStove 2 Bundle is the perfect solution for both campsite and emergency preparedness. This bundle includes the KettlePot and Portable Grill accessory attachments. No Fuel to Buy or Carry: Our stoves cook your meals with nothing but the twigs, eliminating the need for heavy, expensive, polluting petroleum gas, and is designed to run on any biomass. With the built-in internal fire starter, it is quick to light, fast to boil and easy to use. By using renewable resources for fuel instead of petroleum, you're reducing your carbon footprint and keeping fuel canisters out of the landfill. The BioLite KettlePot allows you to bring a single piece of cookware without sacrificing functionality. Whether you are making a pot of coffee to start your day or cooking a full meal for four at the end of a long hike, the BioLite KettlePot is a true grab-and-go system. 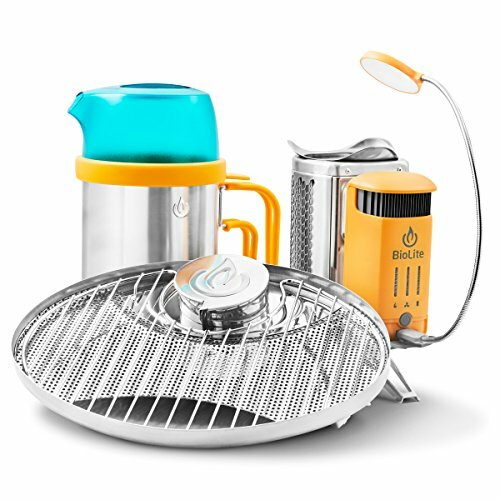 The BioLite Portable Grill Accessory attaches to the CampStove to provide a safe, seamless, and fun way to cook your favorite foods. The unique design allows you to keep sizzling while your fire keeps burning, all without the need for charcoal or propane. It's easy-to-clean stainless steel grill surface fits up to 4 hamburger patties or 6 hotdogs, on 55 square inches of surface area. And, high, medium and low temperature zones help you grill your foods to perfection. Turn fire into electricity! CampStove 2 generates 3 watts of usable electricity for USB charging of LED lights, mobile phones, and other devices. And, the internal, rechargeable 2600 mAh battery stores excess power to charge devices, even without a live fire. Portable Grill attachment transform your BioLite CampStove into a wood-fired grilling surface with this seamless and fun attachment. Steel Grill Grate fits up to four burgers or six hot dogs. If you have any questions about this product by BioLite, contact us by completing and submitting the form below. If you are looking for a specif part number, please include it with your message.